إذا كنت تبحث عن فندق بموقع جيد في كارنارفون، فقد وجدت ضالتك في Carnarvon Motel WA . يمكن من هنا للضيوف الاستمتاع بسهولة الوصول إلى كل ما تقدمه هذه المدينة النابضة بالحياة. يوفر الفندق بفضل موقعة الجيد وصولاً سهلاً إلى أهم معالم المدينة.
. كما يقدم Carnarvon Motel WA الكثير من الخدمات لإغناء رحلتك في كارنارفون. يمكن للنزلاء الاستمتاع بالميزات التالية: واي فاي مجاني في جميع الغرف, مرافق مخصصة لذوي الاحتياجات الخاصة, تخزين الأمتعة, خدمة الغرف, التوصيل من وإلى المطار أثناء إقامتهم في هذا المكان الرائع. بالإضافة لهذا,تتضمن كل غرف الضيوف مجموعة واسعة من وسائل الراحة . بعض الغرف توفر حتى إغلاق, شاي مجاني, مناشف, سجاد, قهوة فورية مجانية لإرضاء أكثر الضيوف تطلباً. يقدم الفندق مجموعة واسعة من وسائل الراحة المتنوعة، كمثل: حمام سباحة خارجي, بلياردو, حديقة, غرفة ألعاب. 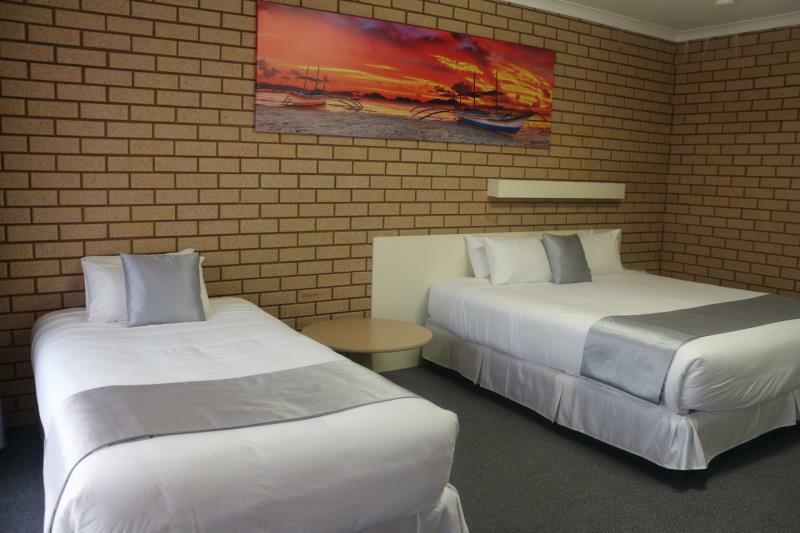 استمتع بخدمات لا يعلى عليها وعنوان ذو اعتبار في Carnarvon Motel WA . Please note that for 'breakfast included' accommodation, the breakfast provided is continental. 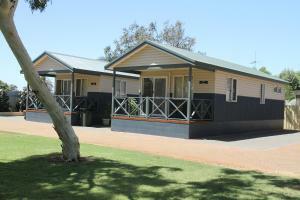 We were only in Carnarvon for one night and the Carnarvon Motel was perfect. Located close to everything, large clean rooms with space to stretch (much better than a 12sqm cabin), a games room for the kids, pool, comfortable beds, and breakfast included was excellent. The make-your-own ham, cheese and tomato toasted were a hit!! The decor is a bit like stepping back into the 70s, but it all adds to the charm. All in all, for a short stay in Carnarvon this ticked every box for us. Our stay was really good. Breakfast buffet was nice. Beds really comfy probably one of the comfier we had for our whole trip on the coast ! Staff are friendly. If I go back to this town I would stay here again ! Location is good. Staffs are friendly. Room are spacious and very clean. Comes with a kettle and microwave as well. Whether you are staying in the motel, it is recommended to try out their hot stone buffet, cost $38. My friend and I tried the salmon and duck, taste was superb. There is wifi for rooms that are close to the reception, not sure about those far away from reception. We also used their washing machine and dryer, cost $7 in total. Pillows are terrible. 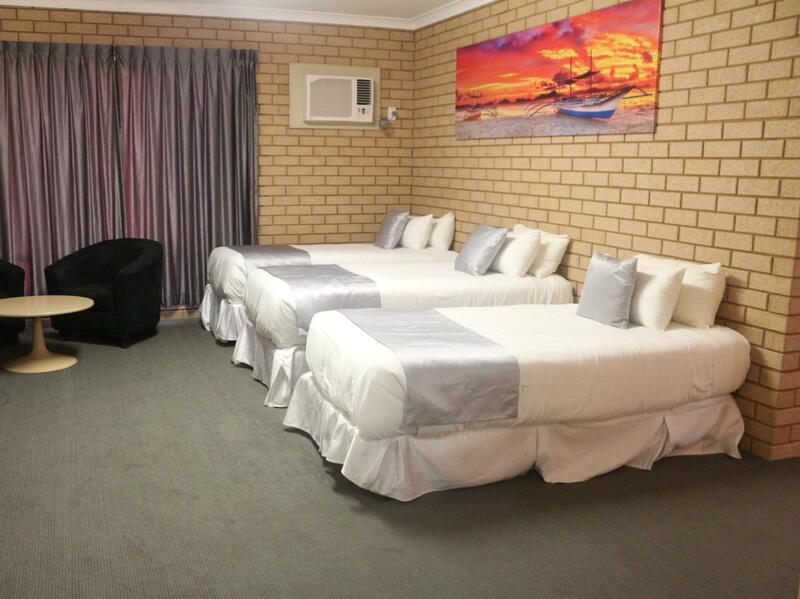 Pretty standard motel facilities, they try to dress it up with nice bed sheets but the pillows are horrible and the beds are the comfiest. If they had nice mattress toppers and a selection of at least 1 other type of pillow it would possibly be worth the price. A Lovely spacious room which was very clean and well provisioned . Dinner in tthe restaurant was a buffet which was well priced and great quality . Continental breakfast was very generous . Staff very friendly and helpful . Lovely stay. Staff & room wonderful. Complimentary breakfast a delicious surprise. Friendly and accommodating staff, clean and spacious. Great complimentary breakfast. Very good deal. My family enjoyed our short stay here. Staff was very kind and understanding to allow us late check out so that we could get our flat tires fixed. Thank you very much! When I arrived there the receptionist very welcomed with a big smile for me. The room was very clean and tidy. The facilities looked old but it doesn't matter. They have a restaurant in front of the reception desk with a large. Breakfast also nice but the pancake machine out of order. The person (who ended up being the owner) who greeted us upon arrival was literally the best part of our short stay here. The bed was surprisingly comfortable but the linens and carpet were unclean (stained) and the room decor very outdated. Free continental breakfast though and literally- the owner seemed like he'd bend over backward to make our stay here if he could. Best of luck to them! Group of 6 in light aeroplane from Royal Aero Club, Perth, touring, found this Motel online, booked and paid online while in the air. Easy walk to motel from Carnarvon aerodrome, where our plane was parked for the night. ( most aerodromes so are crazy far out of town ). Modern, clean facilities, well stocked with tea, coffee, milk, soap, shampoo, iron, hairdryer etc. Upmarket evening meal and breakfast. Friendly and helpful staff. They even made us special Carnarvon banana splits for desert.... WA tourism at its best ! We will be back ! Had a great sleep in the clean, comfortable beds. Restaurant is satisfactory and location is quite good, not far from the main street. Car park is tight and can have limited visibility, especially if people have brought boats or trailers in; we were constantly concerned about unsupervised children running behind our vehicle when we were reversing or maneuvering (although this is largely beyond the control of the motel, they should warn parents of young children when they check in). Would stay there again. We booked for two nights but finally stayed for six! The room was clean and quite big. In the room there is fridge, kettle, microwave, good tv and wifi. The staff is very helpful, always smiling. Would definitely recommend! Secured facilities, staff were very accommodating, you do not need to bring your own toiletries because almost everything is provided. Room, and bathroom is spacious and clean plus breakfast buffet included. Only stayed one night, but would have happily stayed for longer. Pictures on Agoda do not do the place justice. From arrival we were met by friendly attentive staff Main building is spacious and welcoming with very pleasant bar and dining areas, including good outdoor area which has a pool Room was very spacious and clean, with the extra single bed being ideal for some. Did not eat at the restaurant, but spent a pleasant couple of hours in the bar, where again the staff were very friendly. 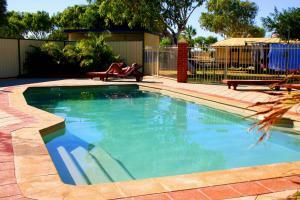 Would definitely recommend to friends and family or visitors using Carnarvon as their base to explore the area. Advertises free wifi but its intermittent at best. Made the commebt last time i was sick of places advertising free wifi but it never works and they replued that nbn was going in.... well if it has then its worse but seriously i doubt anything changed. No big deal but you shoyldnt ve able to add it to your list of facilities if it doesnt work. Id expect a discount if you offered free brekky just to get you to book then find that the chefs just walked out. Great place but unfortunately no gluten free options on the kids menu, so my daughter who is a celiac had to eat somewhere else.